Cooler weather is finally here to take its place. With the advent of fall, it is time to start dealing with the maintenance needs of your heating and cooling system. 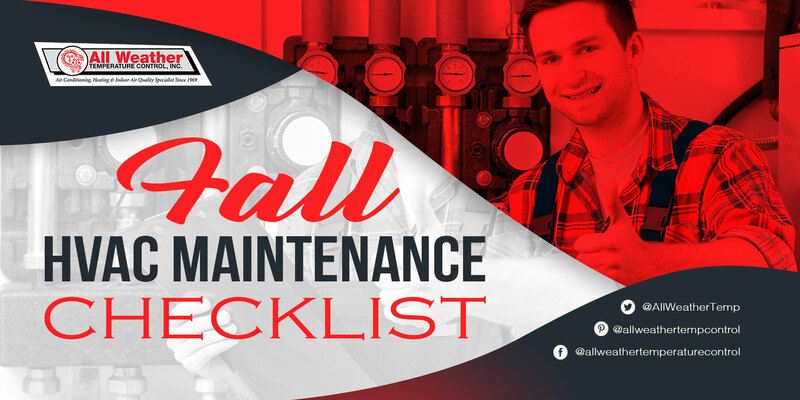 Here is a complete HVAC maintenance checklist to follow this fall season. Clean around your outdoor unit. Maintain a 2 to 3 feet clearance from bushes, trees or shrubs that can tamper its operation. Outdoor units should be free from any hindrances that can affect the airflow. Check your rooftop vents and registers. Start removing leaves, fallen branches, debris or any barriers on the registers to allow the air to pass through in and out of the system freely. Invest in high-efficiency pleated air filters. Go to your trusted local HVAC company and purchase a filter that features electrostatic charges. Have the filter installed in your system as early as today. Inspect refrigerant lines. Make sure to schedule a regular check-up of the refrigerant lines especially this fall. It should be part of your overall maintenance plan. Install a new humidifier filter. Do not wait until winter before replacing your old humidifier filters. Now is the best time to do it. Examine your heat exchanger for leaks and other issues. Check for vibration, leakages especially thermal leakage, foul odor, and other potential problems. Ask a professional technician for inspection for safe and reliable results. Do a combustion-efficiency test. Contact your HVAC contractor for the job. Upgrade your home’s insulation. You do not want to deal with this during winter so begin improving your insulation this fall. Use newer materials with advanced features for the insulation to ensure a cozy and comfortable indoor environment these cold months. Inspect your pipe insulation. Do not forget about your plumbing system. Store your garden hoses and wrap any exposed pipes to prevent them from freezing. Clean and keep your air conditioner clean. Fall is when your air conditioner must take a break. See to it that each part of the A/C is well cleaned before the cold rush comes. Freshen up your chimneys. Start clearing your chimneys. It is important to have it cleaned and serviced at least once a year. If you have not scheduled a chimney cleaning service, you better do it now! Check all alarms. Change the batteries of your carbon monoxide detectors and alarms. Make sure they are in good working condition. Your HVAC system requires regular maintenance for a smooth operation all year-round. For expert maintenance in Long Island, NY, call us at All Weather Temperature Control. We are always ready to serve you!